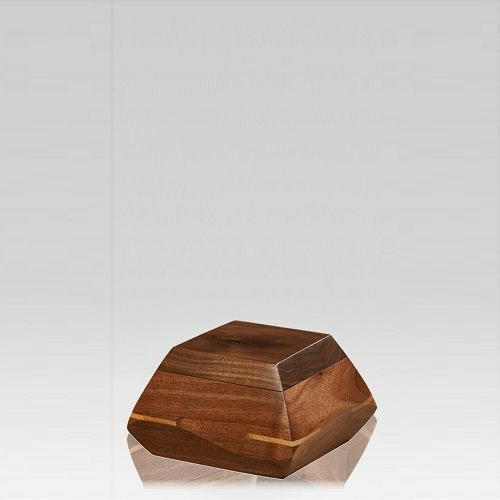 The Trapezium Walnut Wood Keepsake Urn is made of the finest walnut wood. This interesting keepsake urn is individually hand sculpted, and features a unique shape - which offers an exquisite combination with the natural grain in the wood. The smaller size is wonderful for families who are looking to preserve a small portion of remains. Create a truly unforgettable remembrance of a lost loved one with this keepsake urn. "I purchased the pendent for my sister. She lost her eldest son to brain cancer 01/31/2010. The pendant itself is just beautiful, before I purchased this one I spent several hours looking at your selections. I chose this one in particular because of the heart and the wings that wrap around it. It does not look like it would hold a loved ones ashes. It's elegant and fairly priced. My sister wears it 24/7. Knowing she has her son in a way close to her heart has been very special for her. He was a major influence in and on our family. I would recommend and use Memorials.com in the future. I was very pleased with the packaging and delivery of the Angel wings pendant."